Seeing the Grand Canyon should be on everyone's bucket list. It's one of the seven wonders of the world for good reason. But face it, you're busy, and your schedule might not permit you to do the full hike in and hike out. Luckily, there's a brand new and unique way for thrillseekers to experience the canyon up close, and it only takes a few minutes. 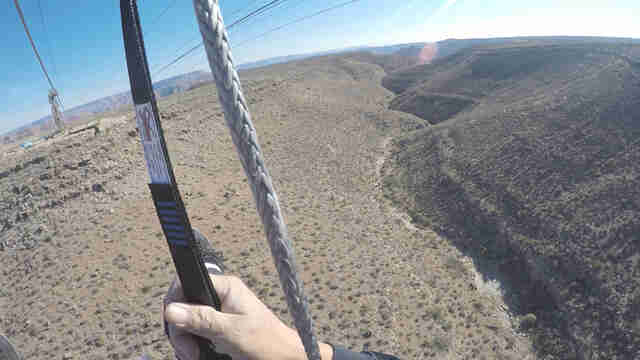 It's a zipline, and it sends you soaring 1,000 feet above the stunning landscape at nearly 50 miles an hour. The Zip Line at Grand Canyon West is the latest attraction from the folks who run a number of other popular Grand Canyon adventure attractions such as helicopter aerial tours, river sightseeing tours, and the super-cool glass-bottomed Skywalk at Eagle Point. It's located at Hualapai Ranch in Grand Canyon National Park roughly a mile from the Skywalk, and flies over a sprawling side canyon. To ride, you climb a few staircases and strap in, then let 'er rip and rush past the scenery -- including views of nearby Quartermaster Canyon. 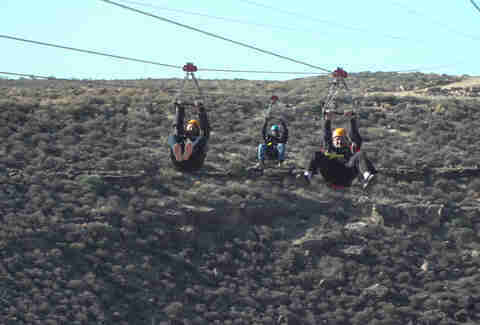 If you want, you can experience it with a group of friends, since the setup is designed with two "quad ziplines," allowing for up to four people to ride from one side to the other all at the same time. The first line measures about 1,110 feet across, while the second, steeper line rockets you 2,100 feet downhill, and both can get you whirring by at up to 50mph. Tickets will set you back a cool $89 apiece, and you can currently only purchase them on-site, but that's actually not a bad deal since it gets you a ride on both lines.